Piriformis Stretch on the Wunda Chair. 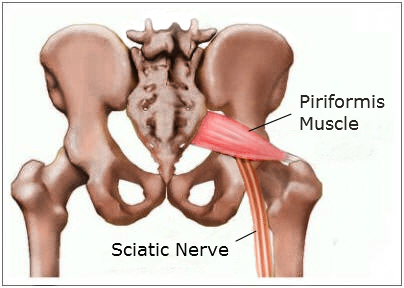 If you are experiencing sciatic pain the culprit might be an inflamed or knotted piriformis muscle. In this video Kerry Margolin demonstrates a nice piriformis stretch on the Pilates Wunda Chair. If your studio is equipped with the Wunda Chair you can do this one as a pre or post workout stretch. The piriformis muscle is a small muscle located deep in the buttock, behind the gluteus maximus. It is one of several muscles that helps the hip rotate externally, or outwards from the center of the body. It runs diagonally from the lower spine to the upper surface of the femur. The sciatic nerve runs underneath, or is some cases through, this muscle and if it becomes inflamed or knotted up pain can be felt from the top of the hip bone all the way down to the big toe. Sometimes this pain is called referred pain, in that it actually originates in a different spot than where it is felt. Sciatic pain can be very tricky to track down. Looking to get started in Pilates in Las Vegas? Choose the level that works best for you. Click here to get started at A Body In Balance!